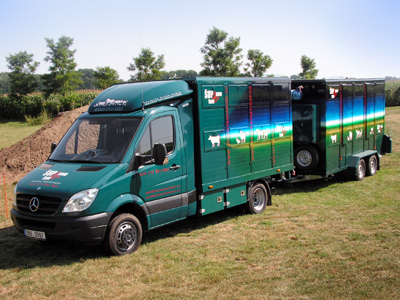 HORSE TRANSPORT AS MY DREAM COME TRUE. 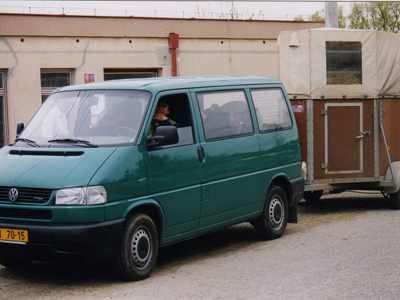 My name is Bronislav Sup and I have the professional horse and animal transport company since 2004. I came closer to the world attached to horses in 1998 and four years later I became a licenced rider. Since that a horse has become more than only a subject to transport but also a subject of real interest and priority itself. Of course my job involves the other animals too. They are insured to have the most professional and responsible care. For me the animals I transport are partners with whoom I set on journey together. I am fully aware of individual needs of any animal kind and even of those of any particular one. Care of the transported animal is my main point of interest. If you are looking for a competent partner to travel your animal than this is definitely the right address. I am offering comfort and stresless enviroment for your darling. Actually the whole storry began in 1998 when I fulfilled my dream and bought my first horse. I used to be attracted by animals since the very childhood. I didn´t become a very skilled rider and I would say I never will but the fascination by horse art continued and went even deeper. As soon as I recognised that the horse is both strong and beautifull animal I realised that it is also extremely sensitive. And the more I lived among horses and horsemans I was interested in horse behaviour and ethology. 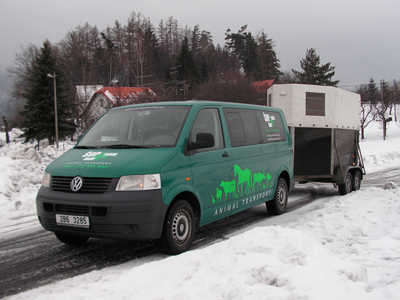 For example: I have had many interesting and even strange experiences with traveling horses international. My beginning. First car and the trailor. Another VW car and trailor after the re-adjustment. And this is a new track made as a special and original poject!